Good Morning everyone. It's Day three of the Newton's Nook June Release and today we are sharing Two Fun Cacti Sets. Cultivating Cacti and Cuppa Cactus, each of these sets have coordinating dies as well. My first project uses Cuppa Cacti, this set is perfect for all your Coffee Lovers out there. I paired the images with some paper from the Heart Day 6x6 pack by Crete Paper and some Wonky Stitched dies from MFT. Each image is stamped onto some Neenah Solar White and colored in with Copics. Then I used the Coordinating dies to cut them out. I added a little Shabby Shutters Distress Ink to the center of the circle behind the stamped images. I wanted a few more pops of Pink so I added some Sequins from Neat & Tangled. 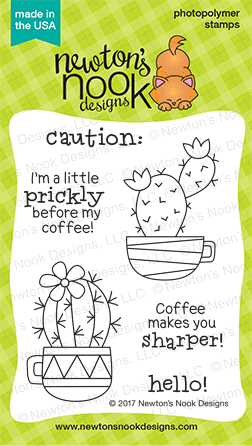 I love this set, there are so many cute sayings and who doesn't love a cactus in a coffee mug? Our second set today is Cultivating Cacti, this is a great set to do the Rock n' Roll technique with. I paired the images with some fun paper from Doodlebug Designs and the Newton's Nook Landboarders Die set. 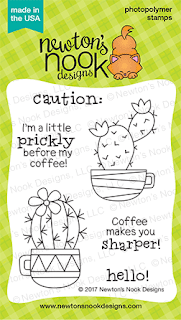 Would you like to win the “Cuppa Cactus set or Cultivating Cacti set” Stamp Set? How sweet, love your cards! Such cute cards! Love the use of the patterned paper. Your cards with these fab cacti sets are DARLING! I'm absolutely smitten with succulents of late and your showcases see me mega watt smiling! Cacti never looked so cute, so charming! The cactus couple...oh my! LOVE! 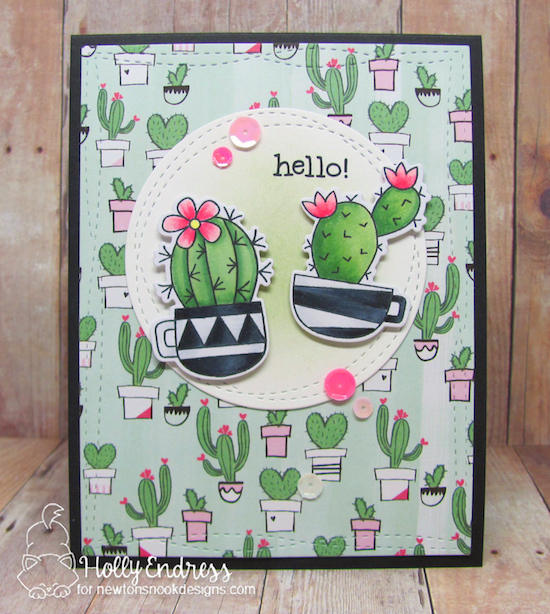 WOW-WOW-WOW, I love the way you showcased your cacti and the patterned paper you used on both cards! Gorgeous cards! The "cactus stamp addict" here is impressed with your pretty cards! 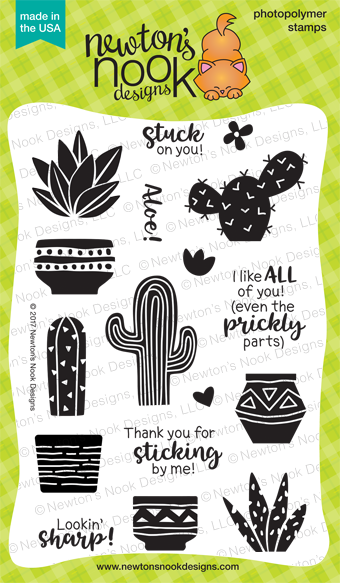 ;) That cactus patterned paper was perfect for the new Newton's Nook stamps! Perfect stamp/ink/paper card. Love this set. perfect matching papers for them. Awesome sauce! Really great cards!! Love the colors! So prickly! Both cards are great, but most of all I love the first card! It's perfect! stash that fits with the stamps. OMG - you found the PERFECT patterned papers to pair with these sets! I love them all! That rock 'n roll technique really works well for these stamps - looks great! How fun are your cards! You make me want these sets even more!!! I love those black and white mugs on the first card! So fun! And the way you used the perfect pattern papers on both is so cute! Oh super fun, I love those cactus creation! Love your cactus cards and the first one is my favorite! Great cards! Love the papers you used! The sentiments in these sets are so fun! These are beautiful! I am in love with these sets! Awesome cards! Love the cactus plants and the pots! Who would think Cactus could be charming?! Your cards are so cute and full of adorable personality! I love them! Delightful creating Holly! TFS! Oooh, the combination of pink and green is so unexpected and totally gorgeous! Wow! 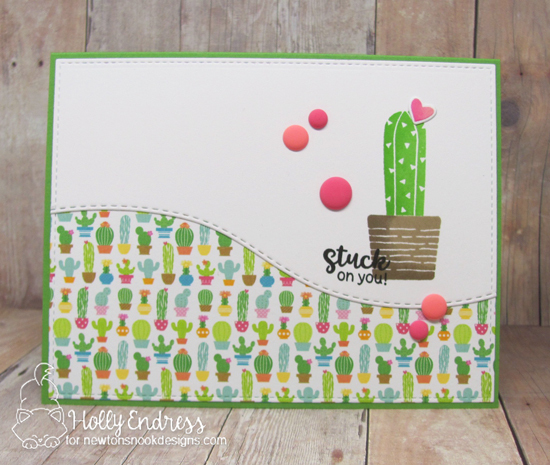 I love so much how you used and coloured these gorgeous cactus stamps!!! Awesome cards!!! Cute cacti and the paper is perfect. Fabulous cards, love the cacti! These cards are so sweet and you found the perfect coordinating paper for the cactus!